Jan 14 "Wine is A Grocery, Not A Luxury"
That's Master Sommelier, winemaker, and now author, Richard Betts's mantra. 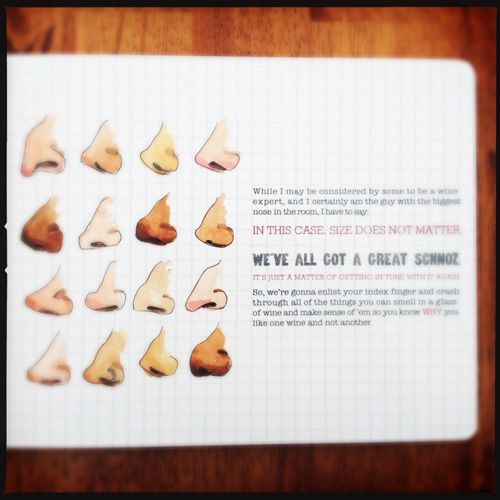 The Essential Scratch & Sniff Guide to Becoming a Wine Expert is a clever collaboration between Betts, illustrator Wendy MacNaughton(whose work I love) and art director and designer Crystal English Sacca. Democratizing wine isn't a fresh notion but Betts's approach, easy and playful, might be. He's taken the ultra snobby, intimidating and too often exclusive club of wine and broken it down into basic concepts, building on the one essential tool required to appreciate wine: smell. Wine is intimidating, perhaps primarily, because the act of tasting it demands a whole new vocabulary. Sure, that vocabulary gets out of hand from time to time (reference's to one's personal history, like Grandmother Pearl's hand-washed stockings drying on the clothes line outside, probably isn't going to find too many empathetic and like-minded tasters) but the language is not all contrived either. Like HTML and CSS, the code behind every web page, there is structure and reason, it is completely necessary and yes, anyone can learn it. Completely foreign at first, with a little background info and study time, we can all get there. And unlike website coding, learning about wine comes with the pleasure of sensory experience of the education. We get to drink, and the more we drink and taste, the more we learn. The Essential Scratch & Sniff Guide to Becoming a Wine Expert covers the basic aromas and flavors found in wine, hitting on the major components of fruit, wood, earth and 'other.' It's a friendly introduction to understanding the language of wine, and once you've got that down, you can better communicate what you like, don't like, and why. The beauty of this approach is that the information is coming from one of the world's most knowledgeable wine people. To obtain the title of Master Sommelier, one has to pass a series of rigorous tests, including the very difficult blind tasting exam. There are only 211 Master Sommeliers in the world today, 135 in North America (Richard Betts was only the ninth to pass the exam on the first try). Needless to say, we can trust where the book's content is coming from. "My most lofty ambition is to help folks enjoy their lives. I do this by jumping up and down about the joys and wonders of wine, completely possessed with the conviction that wine is a grocery, not a luxury. When my work is done, we'll all have wine like civilized people do the world over - at lunch, at dinner, with food, family, and friends." Betts told The Huffington Post in this interview last month, that he makes a choice everyday to be happy, and that drinking wine is part of that happiness. Wine, like food, is meant to be shared with family and friends, over conversation and through connection. He said, "To choose the opposite of happiness is to waste a day and waste a moment. And as far as I know, those are limited moments and I'm here to get after it." For Richard Betts (and I can totally relate), drinking wine is a big part of being happy. Knowing what you're drinking and why makes it even better. 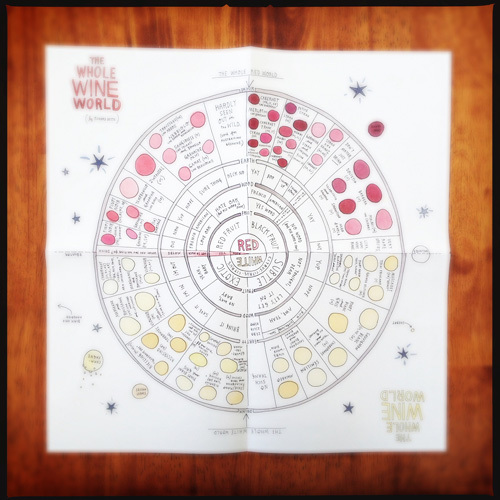 After you read through the book, scratch & sniffing pear, strawberry, vanilla and leather (a few of the possible flavor components found in given wines), a wine chart folded into a small pocket on the back cover will help you figure out what you like to drink, and what you don't like to drink. I had fun with this book, and it's clear both Betts and MacNaughton had fun putting it together. 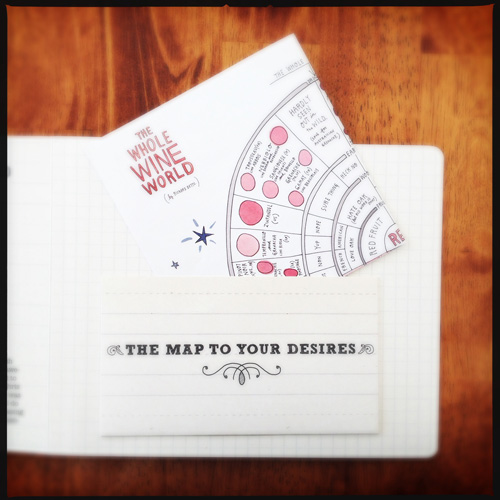 Check it out, give it to a friend, and learn some wine lingo along the way. I promise, it will make it far easier to navigate store shelves and restaurant menus if you do.